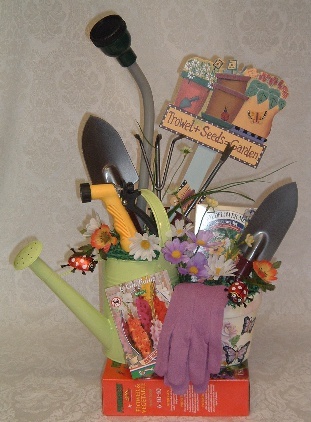 Give your hard working gardener a little help in the garden. Here is everything they will need to have a beautiful yard. Contains a watering can, hose spray nozel, garden hand tools, a set of gloves, a decorative yard stake, a box of flower seeds,a package of bulbs, a flower pot and a box of fertilizer.